Stocks around the globe were pummeled again last week. This is no surprise to our subscribers as our predictive trend analytics model gave us clear technical evidence that important multi-year highs had completed back in the middle of 2015. 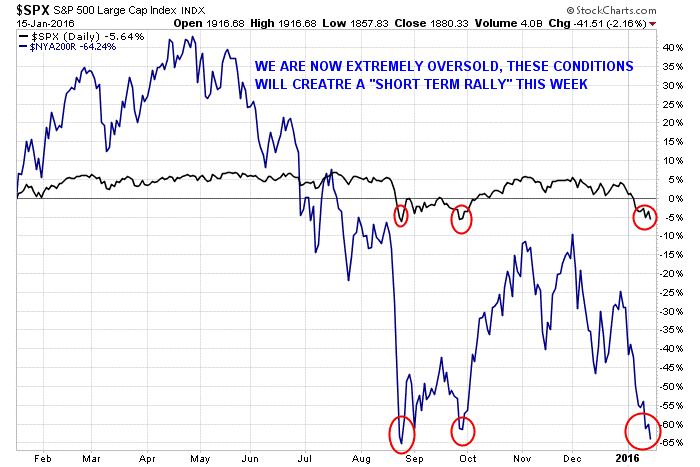 I continue to remain steadfastly bearish in my outlook for stocks. Last Friday, January 15, 2016, the SPX broke below its Aug. 24, 2015 low, which is equivalent to a major sell signal if price closes the month below that level. Last week, The Dow Jones Industrial Average slumped 511 points, or 3.1%, to 15,866, while the S&P 500 slid 64 points, or 3.4%, to 1,856.34, led by the financials, technology and energy sectors. The Nasdaq Composite tumbled 190 points, or 4.1%, to 4,424.35. Subscribers and I managed to catch a 33% quick intra-week bounce trading the SSO ETF and then got out of harm’s way as volatility took hold once again. European stocks were unable to escape the downward trend from other markets, and the Stoxx Europe 600 index lost 2.8%. The dollar fell to a one-year low vs. the yen. Gold rose $22.40, or 2.1%, to $1,096.20 an ounce. 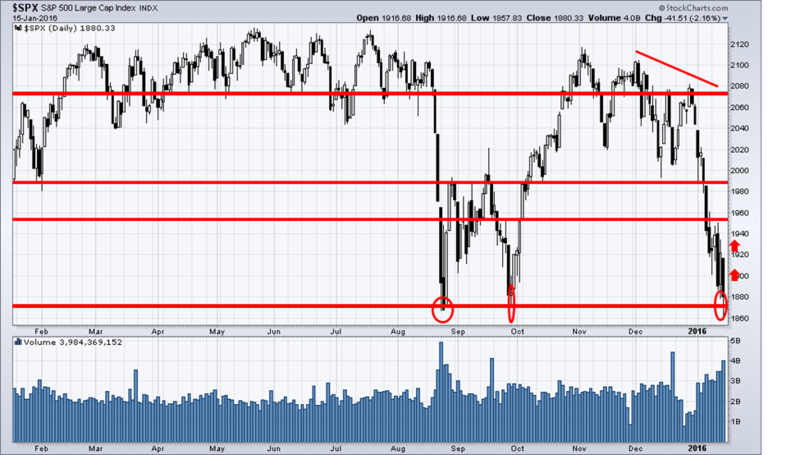 The SPX is currently testing major support. This is consistent with a “cycle low” that arrived over the weekend. Even though we are in a bear market, we should expect a “Bear Market Rally” sucking every last investor into long positions, before dropping much lower through previous support areas. This will be a very “short term bottom” this week. We are in a long term downtrend now; it is not a “hiccup” as we experienced back in 2012. If the stock market is going to stage a rally from here, this is a good time to start, right when everyone is jumping off the ship and the sentiment is so extremely negative. Just to give you a feel for the level of panic selling on Friday, my panic selling indicator which tells us when short term bottoms are likely to happen as everyone is running for the door, this contrarian indicator spiked to 50. Now any reading over 3 is panic in the market, and a reading of 9-18 is typically a multi week low. So you can see how 50 is VERY extreme. Because we are entering a bear market and institutions will be unloading shares area record pace going forward, I feel this extreme level of panic selling (50) is only going to trigger a bounce lasting a week or so, then more distribution selling will take hold. A slew of disappointing U.S. data shows that manufacturing and consumer spending are in trouble. Empire State factory index declined sharply this month to its lowest level since the recession. Retail sales declined by 0.1% in December 2015 and a report on industrial production compiled showed that activity declined for the third straight month. The New Year is not off to good start. In fact, it may be the worst start ever of a New Year in many world stock indices. Instead off irrational exuberance that had previously been so evident, investors of world equity markets are clearly starting to panic. We all know things are not right. We know it hasn’t been okay since the 2008 financial crisis. The effort by the central banks to get over the hump has fueled an “Asset Bubble” in the stock markets. This in turn should start to fuel safe haven buying in gold. Gold’s day in the sun is soon approaching. I believe this new year will prove to be a pivotal year for gold, silver and miners. The “talking heads” tell us that the stock market is falling because energy prices are falling. We need higher energy (gasoline) prices. Really? They claim that energy companies are going out of business and that tens of thousands of people will lose jobs and unemployment will rise. Really? Didn’t the jobs numbers show hundreds of thousands of people getting new jobs – in fields outside of energy? Who are you going to believe? Later this week I will be posting an exciting video show you how to make a fortune during this pending bear market and exactly how I did this in 2008 – 2012 to become financially free before I turned 30 years of age. Stay tuned and be sure to opt into my free email list if you want to see this exciting, inspiring and educational video! The post WARNING: BEAR MARKET RALLY TRAP AHEAD appeared first on Stock & ETF Forecasts and Trading Signals.